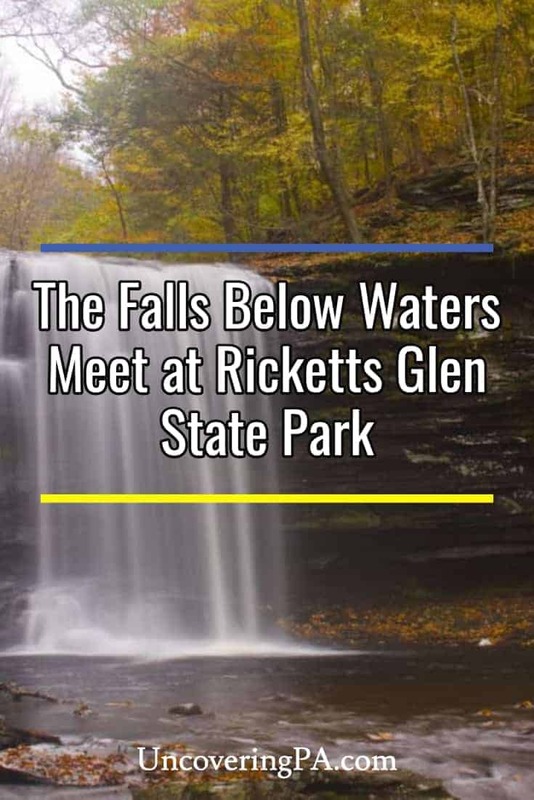 The area between Route 118 and Waters Meet at Ricketts Glen State Park is only home to three waterfalls. And, while this might be the section of the Falls Trail that has the lowest concentration of waterfalls, these three falls are some of the best in the entire park. Many visitors to Ricketts Glen park at the Falls Trail lot along Route 118. If that’s what you do, you’ll have to hike along Kitchen Creek for 1.3 miles before reaching the first waterfall. While this walk is pretty, it is uneventful. 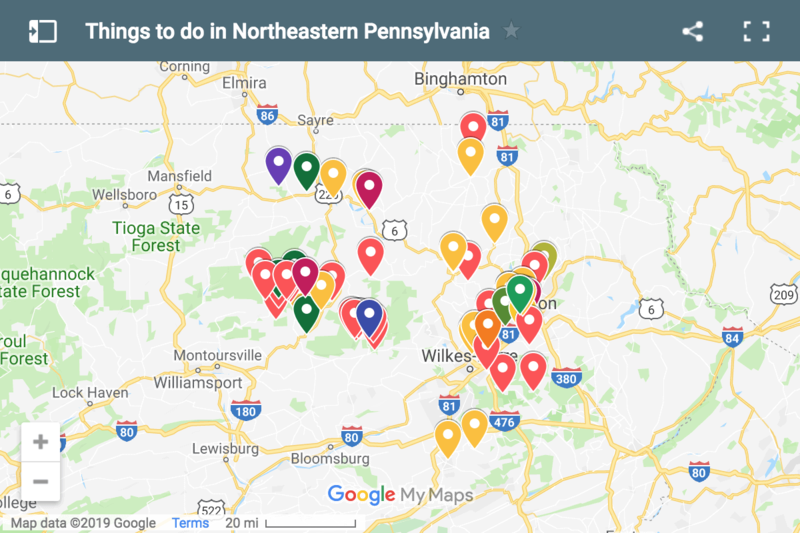 If you instead opt to follow the advice I gave you in the article about tips for hiking the Falls Trail in Ricketts Glen, and park at the Lake Rose Parking Area at the top, you’ll approach these waterfalls from above and cut roughly 2.5 miles off your total hike. If you did park at the above lot, don’t make the mistake of skipping the three waterfalls below Waters Meet. Yes, visiting them does add a mile to your hike. However, these waterfalls are worth the extra time and effort to see them. The waterfalls are listed below as if you are hiking down from Waters Meet. 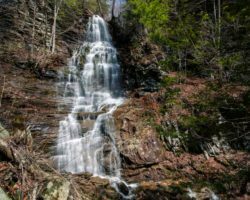 Should you be hiking up from the Route 118 parking areas, you’ll come to these waterfalls in the reverse order. Harrison Wright Falls is one of the most beautiful and photogenic waterfalls in the entire park. This waterfall is only 27 feet high, but given that it drops in a single fall (at least in high water), it seems taller than that in my opinion. 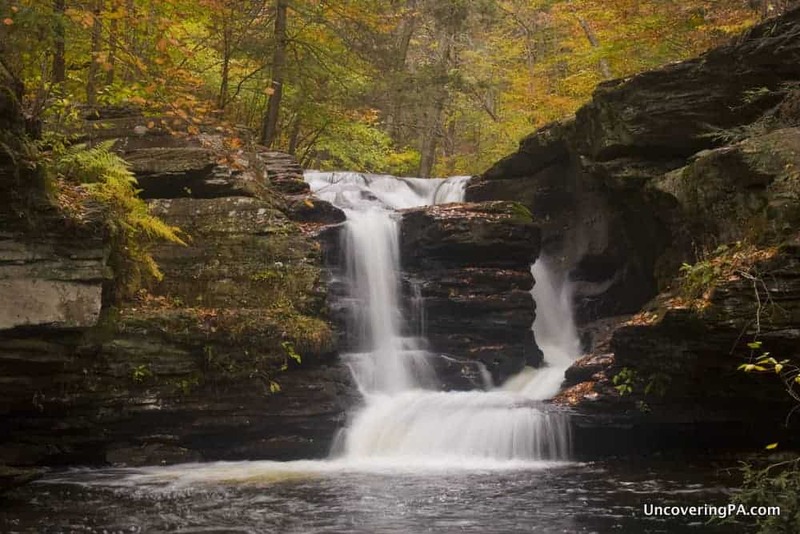 The area below Harrison Wright falls is a large caldron that reminds me of the area around Sullivan Falls in State Game Lands 13. When hiking, you’ll pass along the side of this area, giving you many great angles of the waterfall. Harrison Wright Falls is one of six in the park named after people (including all three below Waters Meet). 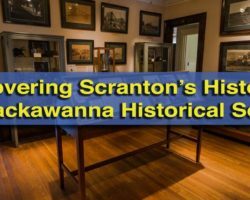 Harrison Wright was a friend of R. B. Ricketts, the man who owned the land and named the falls. 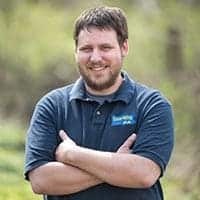 Wright was a lawyer with an interest in archeology who worked with Ricketts at the Wyoming Historical and Genealogical Society. 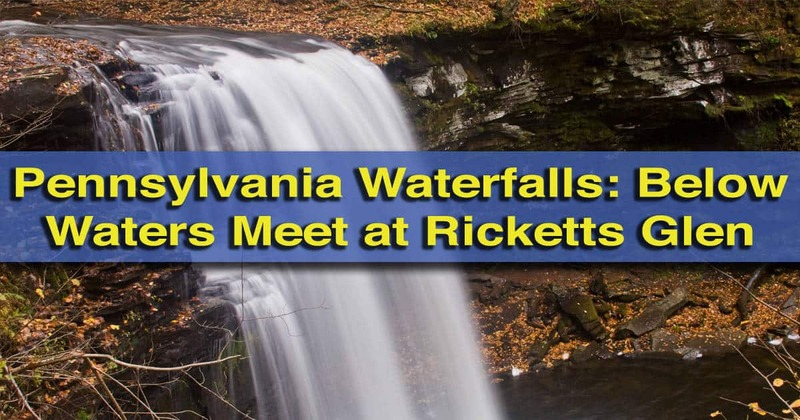 While I have no proof of this, I wonder if Ricketts name the waterfall after Wright due to his passing at the age of 35. 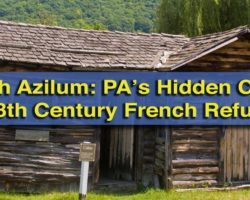 The timing seems to fit, but I couldn’t find anything to confirm this. Sheldon Reynolds Falls is the second waterfall you’ll come to below Waters Meet. 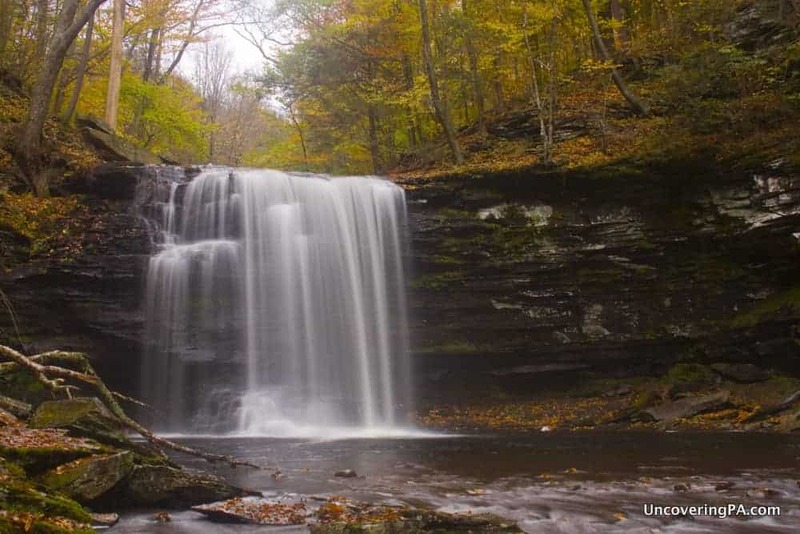 At 36 feet, Sheldon Reynolds Falls is the tallest waterfall in Ricketts Glen below Waters Meet. This waterfall falls onto a large rock and then cascades into the pool below. This, combined with the more narrow stream of water coming over the edge makes this waterfall look shorter than Harrison Wright Falls, even though it’s 9 feet taller. Sheldon Reynolds was the brother of Ricketts’ wife and was a lawyer, banker, and historian. 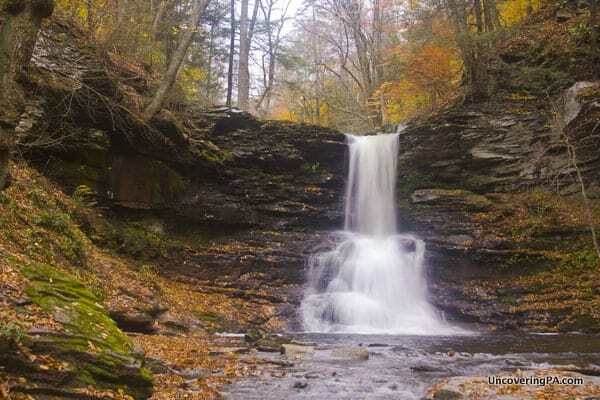 Murray Reynolds Falls in Ricketts Glen State Park. Despite only being 16 feet tall, Murray Reynolds Falls is one of the most beautiful waterfalls in the park in my opinion. I love the unique way that the water cascades around the a large rock formation in the middle of the falls. This feature was the source of the waterfall’s original name, Pulpit Falls. Today, the waterfall is named after G. Murray Reynolds, who was the second brother of Ricketts’ wife. Murray Reynolds was a colonel and politician in nearby Wilkes-Barre. If you’ve hiked down the Murray Reynolds Falls from Waters Meet, you have two choices. First, you can continue 1.3 miles to the parking area, if you started your hike here, which is also where you can see Adams Falls. Otherwise, turn around and hike back up to Waters Meet. Once at Waters Meet, you have two choices. My recommendation is to head up Glen Leigh by crossing over the small footbridge and heading to your right. However, you can also head up Ganoga Glen by going straight. 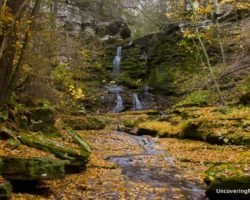 And, if you haven’t already, don’t forget to check out my full article with tips for hiking the Falls Trail in Ricketts Glen State Park.